In 2015 the US National Institute of Standards and Technology (NIST) began a process to produce guidance on approaches to aid communities in improving their resilience to prevailing natural and man made disasters that could affect their jurisdiction. 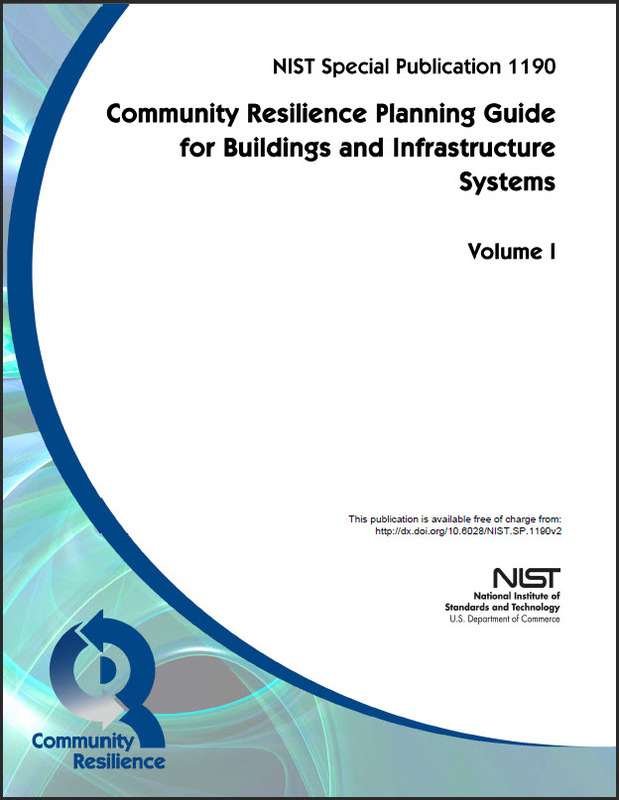 NIST began to produce various guides to offer some processes for community planners to follow including understanding and assessing their current risks as well as develop plans to implement to improve their resilience. Using the "Guides" the community planners can better integrate their resilience efforts into their economic development, zoning, and other local planning activities impacting buildings, public utilities, and other infrastructure systems. The first document produced by NIST is Community Resilience Planning Guide for Buildings and Infrastructure Systems Volume 1. (11MB Download, 125 pages). Volume I describes the methodology and has an example illustrating the planning process for the fictional town of Riverbend, USA. As part of this methodology, Volume 1 includes a "Six-Step" Process to Planning for Community Resilience." (Shown Below). Although the graphic is offering an elementary project planning structure, the contents and discussion of Volume 1 on how to approach the challenges of assessing and improving the resilience of the community is useful. The third Guide just issued in this series is focused on Economics and "Economic Decision Making." 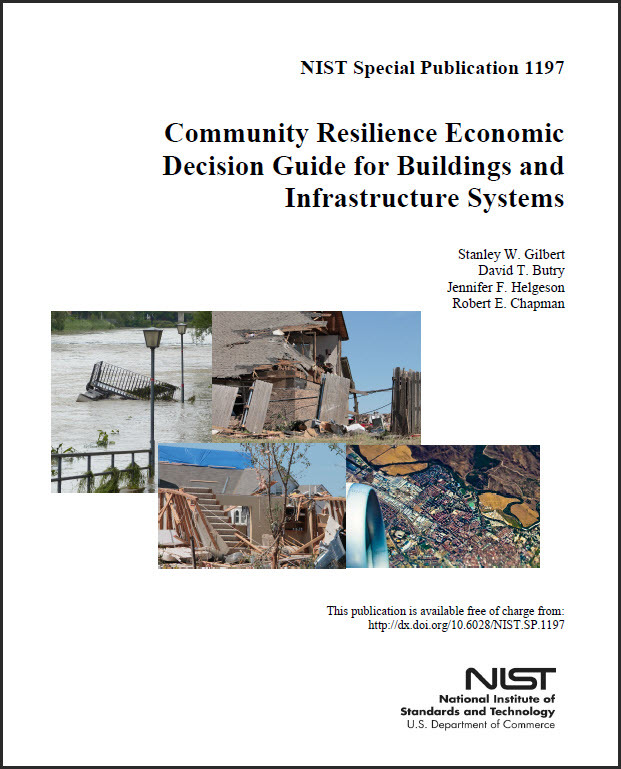 Per the NIST announcement the Economic Guide "... provides a standard economic methodology for evaluating investment decisions aimed to improve the ability of communities to adapt to, withstand, and quickly recover from disasters." The report is intended to frame the economic decision process by identifying and comparing the relevant present and future streams of costs and benefits with benefits realized through costs savings and damage loss avoidance. As observed in the report benefits are primarily determined as the improvement in performance during a hazard event over the status quo, i.e., those obtained directly or indirectly by implementation of the new resilience strategy. And for cost analysis, costs include all costs, including negative effects of implementing a resilience action. That specifically includes the initial costs, operation and maintenance costs, end-of-life costs, and replacement costs. In addition, any non-economic costs (e.g., deaths and injuries) and negative externalities need to be taken into account. Who Are Served by These Reports? These reports appear to be excellent resources for city, county, regional and national planners -- especially those examining disaster recovery and Continuity of Operations (COOP) policies, procedures and budgets. Also, students of infrastructure management should find these reports to be very useful -- not only for their content but also for the references cited in the document and for each analyzed critical infrastructure in Volume II.